While walking through a city one day, I was suddenly overwhelmed by the enormity of this world; more specifically, the sheer number of people who walk this earth, and the constant increasing of that number. I started thinking about what the ramifications of the growth in population would be if, say, our resources became more limited due to some natural event. And what lengths would the government go to in order to control the growth in population. 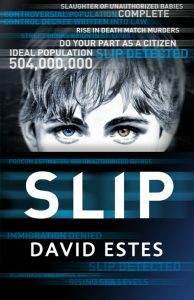 Slip was born! At the core of this story, I wanted it to be about a family and their struggles in the face of seemingly insurmountable obstacles. Each of my characters fill a role in this family dynamic that drives the plot of the story. There is the illegal child who should, according to law, never have been born. There is the confident (bordering on cocky) other, legal son, who suddenly realizes his life is a fantasy. There is the father who is struggling to hold everything together, and the wife who can't handle things anymore, losing a large part of her mind while gaining an entirely new perspective. These four people are the core of the story. She likes the way the pretty colors shoot from the angel’s wings. White light bursts through Janice’s window and hits the angel, which twists and turns and dangles from a string—it’s an invisible string, but she knows it’s there because she once stood on a chair and felt it—attached to the ceiling, with reds and yellows and blues and greens that sparkle. So pretty. So mesmerizing. Sometimes she stares at it for hours. It helps her forget about the things she wishes she didn’t know. The things that make her want to claw at her arms, to pull out her hair, to scream and scream and scream. All the things she’s not allowed to do anymore. They keep her nails short—her hair, too. She feels like a boy. Screams are allowed, but they always make someone run in, strap her to the hard bed, and stick a needle in her arm. She hates the needles, even if they make her feel better for a while. The stained-glass angel was a gift from her son, Harrison. He gave it to Janice years ago, back when she was first committed—has it been seven years or eight?—back when he used to visit. But he hasn’t visited in a long time, something she’s glad for. A son shouldn’t have to see his mother like this. So broken, so incomplete, like a box of scattered puzzle pieces missing half the shapes. So—she hates the word but knows it’s the right one—crazy. The funny thing about that word is it describes most of the people on the outside, too. The thought makes her laugh, which she knows only makes her appear even crazier. But no one’s watching her. Well, not in person. The dark purple Eye is always there, silently observing, and she knows there are real people on the other side, wearing their white coats and scribbling notes on clipboards. Making sure she doesn’t scratch, doesn’t tear, doesn’t scream. Staring vacantly at the twirling angel is okay, even if she makes funny noises, like ooh and ahh and heeheehee, which she does only to amuse herself. Janice knows all the tricks. The padded door opens without a knock. They never knock. Knocking suggests she has a choice in who enters her room, which couldn’t be further from the truth. The man who enters looks familiar, but at the same time, he’s not. She’s known him for twenty-five years, and yet doesn’t know him at all. He visits all the time. His dark blue eyes are jagged with red veins around the edges and he looks five years older than the last time he visited, which was only a week ago. Work must be stressing him out. “Hi, angel,” he says. She hates when he calls her that. She’s not an angel; the spinning, color-spouting glass figurine hanging from the ceiling is an angel. Her son was an angel. “Harrison says hello,” her husband says. “No he doesn’t,” she says, returning her gaze to the angel, which is still spinning, as if they’re not even there. He doesn’t reply to that, because he knows it’s true. As he steps closer, she resists the urge to scream, to run to the window and shake the metal bars, to bang her head against the padded walls. When he crouches down next to her, she resists the urge to fall into his arms, to let him hold her like he used to, before her whole world fell apart. “Why don’t we sit on the bed?” he asks, his voice barely louder than a whisper. “I like the floor,” she says, her bottom lip trembling. No, not just her lip, her entire body. She’s shaking from head to toe. And then his arms are around her and he’s saying, It’s okay, shhh, it’s okay—but it’s not okay, is it? Nothing will ever be okay, regardless of whether she’s in this padded cell or on the outside and free. She opened the door, like always, already smiling. Felt her body go numb and the smile fade from her face. The room was torn apart, the couch tipped over, the holo-screen shattered, glass shards littering the floor. “Michael!” she shouted, panic rising like bile in her throat. She found him on the floor, his face covered in a mixture of sweat and tears. He was staring at a picture of him—of their baby. The boy with no name. She could only get three words out of him, three words that changed her life forever. “They took him,” he said. “But they never found me. They never realized your tricks.” The words somehow slip past Janice’s gritted teeth, more growls than human speech. “Not everything,” she says, pushing off of his chest. She stumbles into a corner, anger and sadness and self-loathing rolling off of her in waves. Michael scrambles to his feet, holding his hands in the air. “Okay, okay, I’m going now,” he says, reaching for the door. She keeps screaming, feeling her face turn red with warmth and exertion. “Goodbye, Janice,” he says, slipping out and slamming the door. Ready to start a family? Apply for an instant Death Match today! Simply speak “Yeah Baby” into your holo-screen to get started. Do pregnancy the right way, the legal way. This advertisement paid for by the Department of Population Control. Fees may apply.